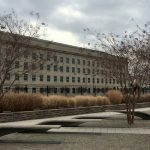 As I walked up to the Pentagon Memorial Gateway, I was surprised. So much brown and gray, nothing big. Other than the American flag flying at the entrance, nothing much stands out. I was underwhelmed, and clearly did not understand. I also broke one of my own travel rules — and didn’t read up about it before I went! 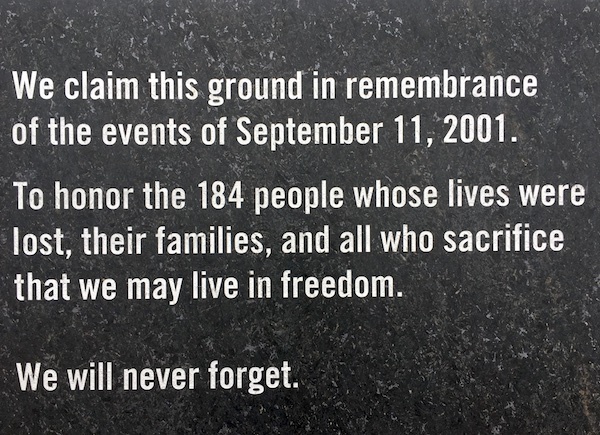 Ben and I explored the Pentagon Memorial with no real frame of reference, other than knowing it existed to remember all those who lost their lives at the Pentagon on 9/11/2001. 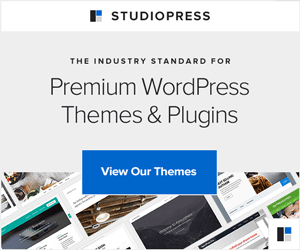 In some ways, I think our initial ignorance as to the purpose of each design element pushed us to look deeper and figure it out. When we realized how all the layers of symbolism fit together, the Memorial became personal. Intimate. Real. We both felt the profound sense of loss — so many lives cut short. Real people with names, birthdays, families. Some families lost more than one — and that story is told here too. Simple elegance — a powerful statement made quietly. We had no choice but to listen and learn. Understated. Elegant. Profound. What happened here on September 11, 2001? On September 11, five hijackers boarded American Airlines Flight 77 which was bound for Los Angeles, California. The plane had 64 people on board, a crew of 6 and 58 passengers (including the hijackers). Somewhere over Kentucky, the hijackers gained control of the plane and turned it south, eventually aiming it toward Washington, D.C. At 9:37 a.m., the hijackers crashed the plane into the Pentagon, killing everyone on board the plane and another 125 people on the ground. Of course, our country — and the world — was changed forever by these attacks. 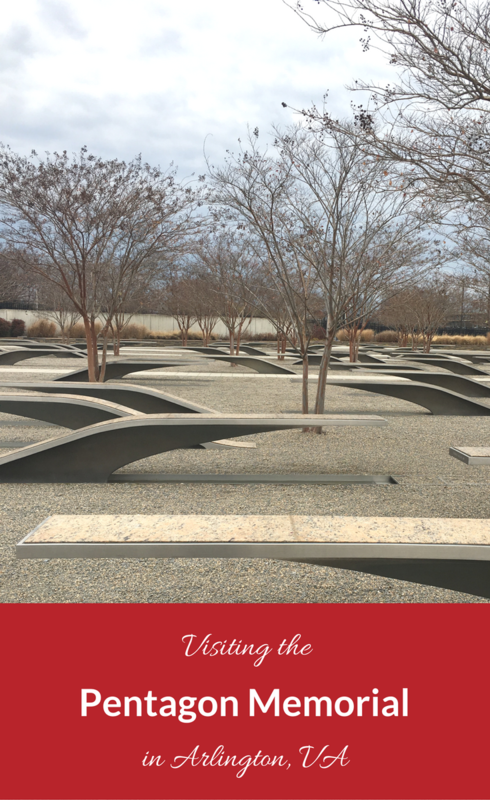 The symbolism throughout the Pentagon Memorial tells a personal story that tears at the heart. My first impression (knowing nothing about the Memorial before I got there) of the design made me think of the wings of birds, perhaps suggesting that we will fly again. But, that was not the designers’ intent. Each person who lost their life that day is remembered forever on a memorial unit placed on an age line according to the year the person was born. Each age line is marked by a stainless steel strip that crosses the Memorial. It’s a calendar, of sorts, that reminds us of how fragile — and precious — life is. Many age lines have multiple victims, so individual memorials are placed along the age line in order of birth date. Some age lines have no victims, a silent marker that reinforces the passage of time (and loss). 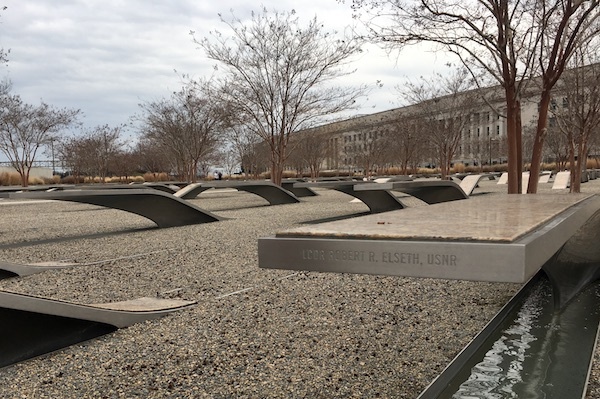 Each person who died in the Pentagon terrorist attack is memorialized by a cantilevered bench placed on their age line (year of birth). 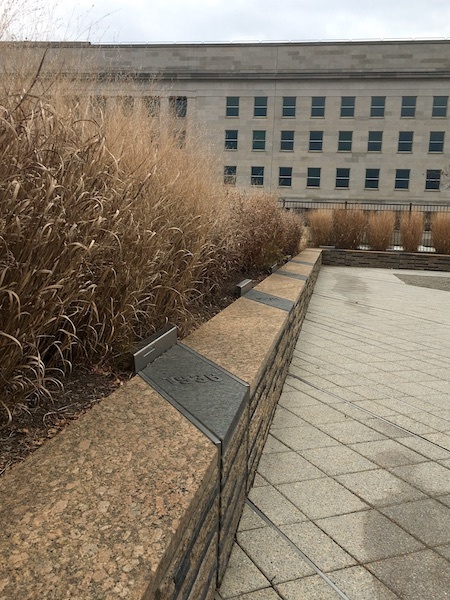 The 125 Memorial Units that honor the victims who were in the Pentagon are placed so that visitors see the victim’s name and the Pentagon in the same view. The Memorial Units that honor the 59 victims who died on Flight 77 are placed so that visitors see the victim’s name and the direction of the plane’s approach in the same view. The bird wings weren’t bird wings at all, though it’s an image that stuck with me when looking across the Memorial. The Pentagon Memorial is surrounded by the Age Wall. In the photo, above, you can see the year 1936 on the wall. Look below to find the stainless steel stripe. The stripe runs from this marker across the entire Memorial. Every person who was born that year and died in the attack is remembered along that age line. Further, the wall grows by 1 inch per year above the perimeter bench from three inches (the age of the youngest victim) to 71 inches (the age of the oldest victim). It wraps the memorial in softness and provides some sense of privacy while reinforcing the magnitude of the tragedy here. Lives taken too early. The Pentagon Memorial is open 365 days per year, 24 hours per day. Restrooms are open from 7 a.m. to 10 p.m. daily. Admission is free. 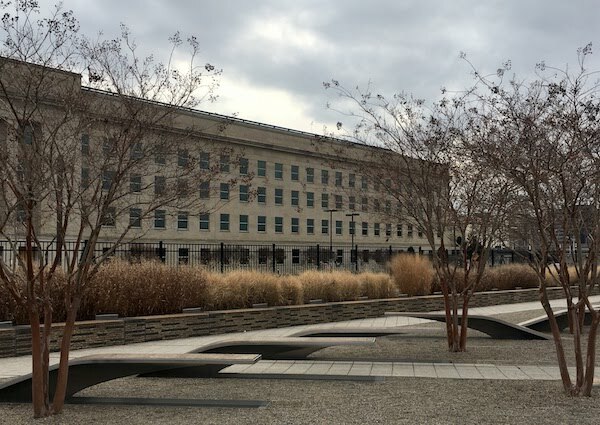 Getting to the Pentagon Memorial, especially on weekdays, is best done by Metro (click here for our beginner’s guide to the DC Metro)! There is no public, daytime parking at the Pentagon or the Memorial. On evenings and weekends, private cars may park in the Hayes Street Parking Lot. 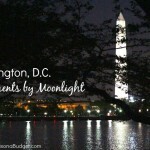 Visitors can also park at Pentagon City and take a tunnel to the Pentagon and the Pentagon Memorial. I strongly recommend the Metro, but you can click here for all options. 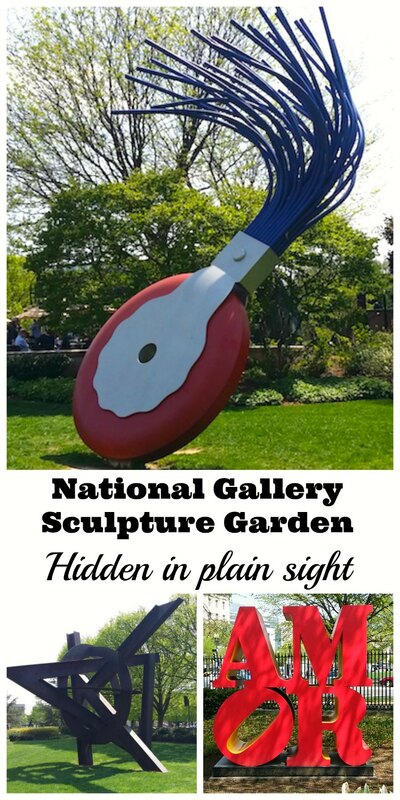 Photos are NOT allowed on the Pentagon campus except within the Pentagon Memorial. Please respect all Pentagon rules when on the campus. I found the New York memorial to be beyond the understanding of young children and don’t recommend to families with kids under age 12 (unless they have studied the attacks and have some frame of reference to interpret the exhibits). The Pentagon Memorial is different. The calendar type layout makes it easy to understand that kids and adults were affected by these attacks. Of course, the content is sensitive, but the memorial’s presentation is not so overwhelming that kids might leave traumatized or afraid. Please, though, remind kids that this is a memorial — to remember people who died. It’s not a place to run and play, but a place to talk about the tougher issues of life and death, good and bad. 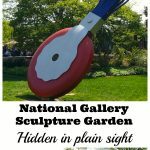 Allow 30-60 minutes for your visit. 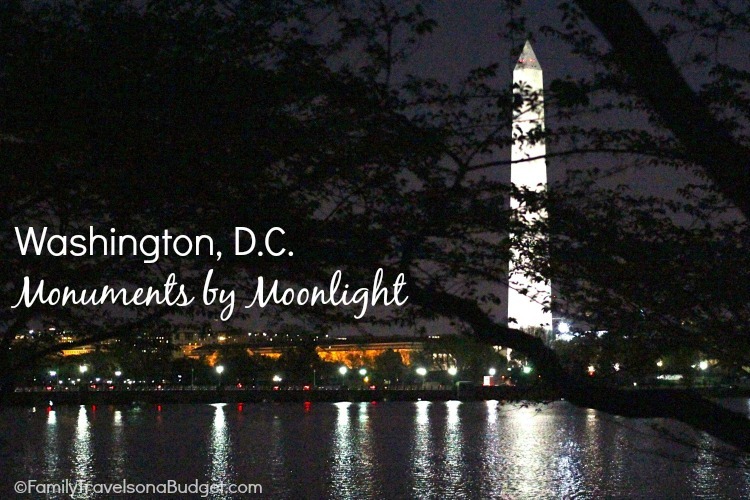 Bonus Tip: Go after dark if you can. Uplighting from each pool under each bench gives the memorial a whole different feel. We didn’t visit at night, so I don’t have a photo, but I’ve seen it online. I plan to visit again on my next trip to the area. Each memorial honoring those who died on 9/11 helps us remember — in its own way — so that those who died will never be forgotten. 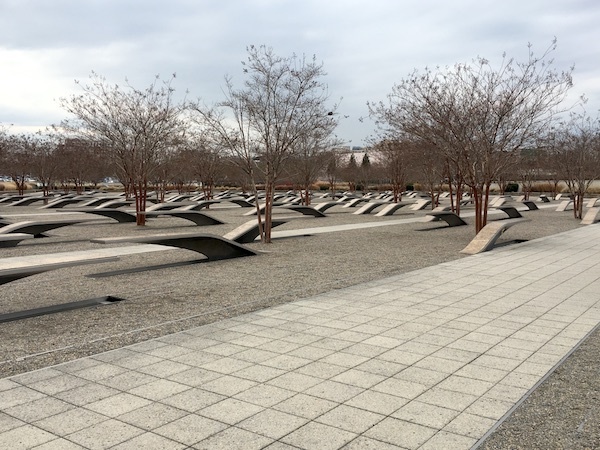 When visiting Washington, DC or Arlington, please visit the Pentagon Memorial. Reflect, remember and honor those who died. I didn’t even know this existed. I definitely need to add this to my list!